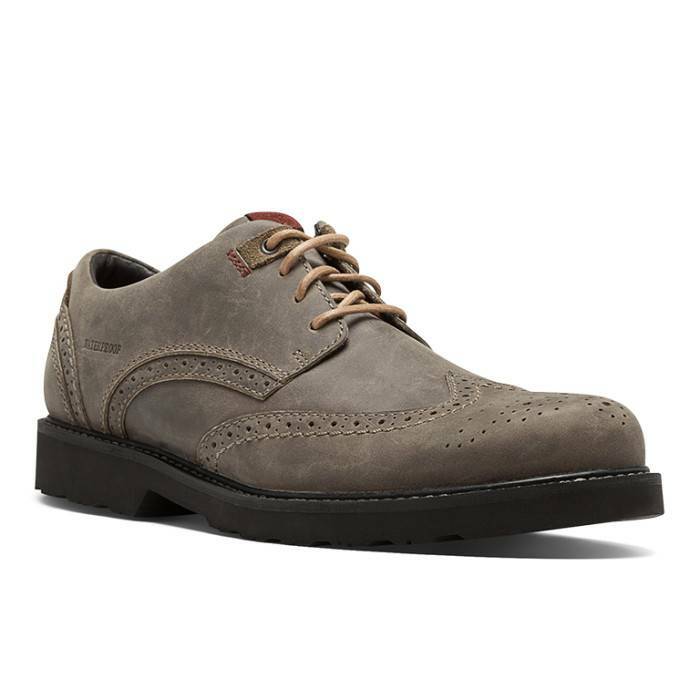 When casual sneakers or running shoes are not an alternative; you find yourself searching for dress shoes not knowing what shoe features or characteristic you should be looking for. With this in mind, we get a number of customers complaining of painful dress shoes, not knowing there are comfortable dress shoe alternatives. Many of our customers and possibly you; may be wearing cheap unsupportive dress shoes that continue to hurt your feet and stretch your plantar fascia. For this very important reason, we at Lucky Feet Shoes recommend wearing supportive shoes that will help you ease the pain of plantar fasciitis. What should you look for in a good pair dress shoes for plantar fasciitis? With years of experience, we know that dealing with plantar fasciitis is not a walk-in-the-park and shopping for comfortable dress shoes for plantar fasciitis can we overwhelming for most. However, it shouldn’t stop you from looking your best when sneakers are simply not an alternative. As a result, when you are searching for best men’s dress shoes for plantar fasciitis; you should look for key features such as excellent arch support, contoured footbed, and deep heel cups. 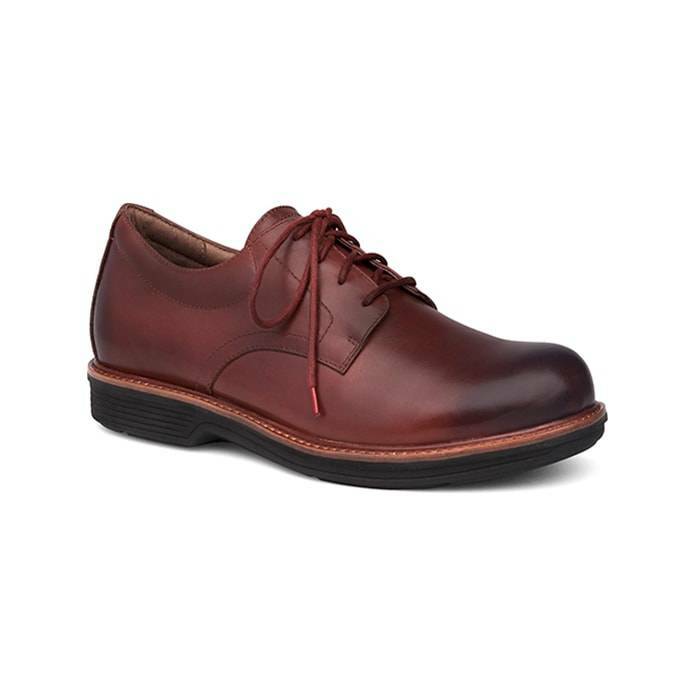 When you are searching for comfortable men’s dress shoes for plantar fasciitis, you should always look for arch support. Make sure there is enough arch support to prevent your keep from flattening out. Contoured footbeds in men’s dress shoes are a must! Shoes that offer an excellent combination of both arch support and contoured footbeds promote healthy body alignment; by evenly distributing your weight across your foot. Deep heel cups in most men’s comfortable dress shoes for plantar fasciitis can offer heel pain relief when most dress shoes that lack heel cups seem to cause. Certainly, deep help cups help cradle your feet and redistribute pressure across your foot. In addition, they help keep your heel padded while keeping you stabilized with every step. Earlier in this blog, we agreed that shopping for dress shoes for plantar fasciitis is not an easy thing. So, we simplified it for you by listing our recommended men’s dress shoes for plantar fasciitis. Find below our top dress shoe recommendations for plantar fasciitis. 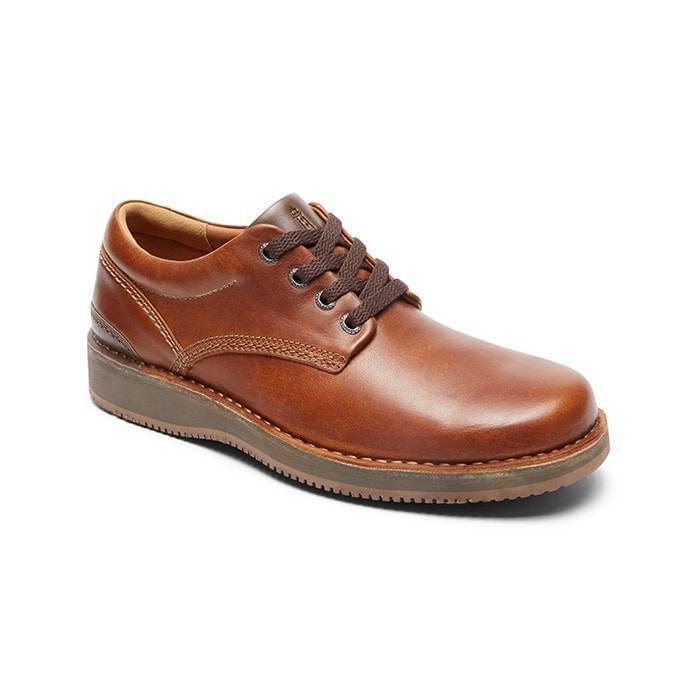 The Rockport Men’s World Tours are great shoes for Plantar Fasciitis. The shoes provide plenty of heel support and have amazing flexibility in the forefoot. In addition, their padded collar and tongue will help keep blisters from forming. 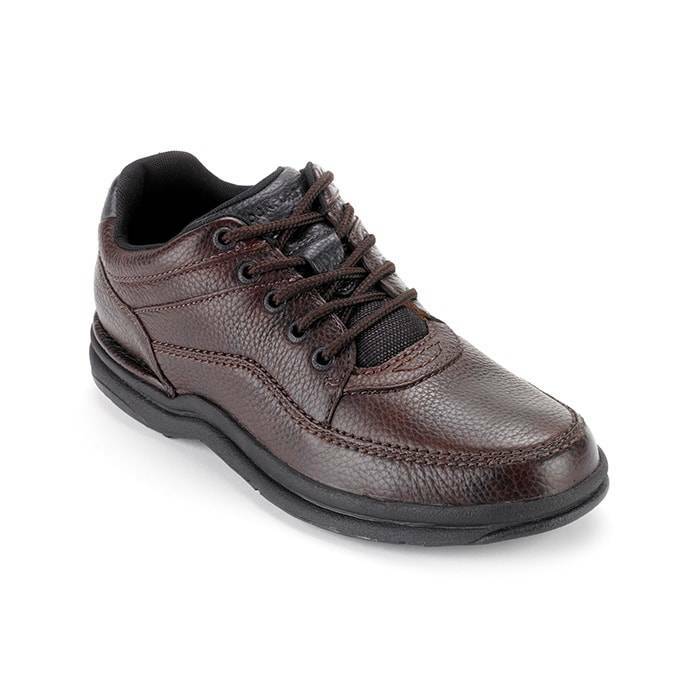 The Rockport Plaintoes are very comfortable, supportive, and stable shoes. These shoes have an EVA cushioning that conforms to the shape of the foot for a personalized fit, which provide support, a secure fit and great cushioning. They offer moderate arch support but if you are looking for additional arch support, they provide enough room for shoe insoles. The second you try on the Dunham REVdare, you’ll feel the comfort in memory foam. They are good for Plantar Fasciitis for their stable shank embedded into their midsole, which help support the arch and create a smoother gait. They come with a removable footbed, which allow for easy accommodation for orthotic insoles. 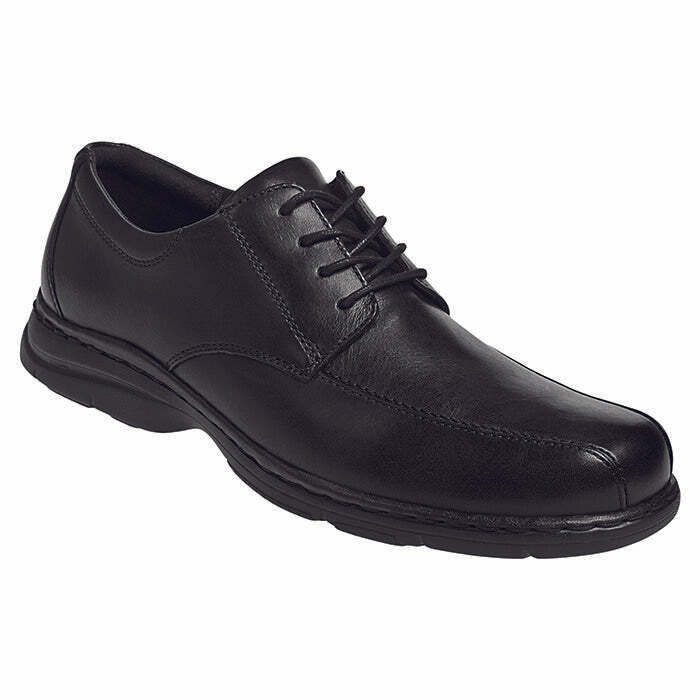 These men’s dress shoes are very comfortable and excellent quality. They are great for plantar fasciitis for their removable, triple-density eva footbed with arch support and heel stabilizer. In addition, these have the same great anti-slip abilities as the Dansko Clogs. Come into any one of our stores located in Costa Mesa, Anaheim Hills, Rancho Cucamonga, Riverside, San Dimas, Long Beach, Temecula, La Quinta and Palm Desert! Visit us today so you can try on a Comfortable Men’s Dress Shoes for Plantar Fasciitis! At Lucky Feet Shoes, we carry many plantar fasciitis shoes: sandals, heels, walking shoes, running shoes, casual sneakers, clogs, wedges, flats, booties, and boots; in order to provide you with a large selection of Comfortable Men’s Dress Shoes for Plantar Fasciitis. Come and visit us today! If you are looking for Comfortable Men’s Dress Shoes for Plantar Fasciitis in Anaheim, Anaheim Hills, Yorba Linda, Brea, Orange, Placentia, Costa Mesa, Santa Ana, Fullerton, Irvine, Villa Park or Tustin; then visit our store in Anaheim Hills or Costa Mesa. If you are looking for Comfortable Men’s Dress Shoes for Plantar Fasciitis in San Dimas, Long Beach, Cerritos, Glendora, Pomona, Covina, West Covina, La Verne, Azusa, Diamond Bar or Claremont; then visit our store in San Dimas or Long Beach for your footwear needs. If you are looking for Comfortable Men’s Dress Shoes for Plantar Fasciitis in Rancho Cucamonga, Ontario, Upland, Fontana, Rialto, Chino, Chino Hills, Mira Loma, Eastvale, Colton or San Bernardino; then visit our store in Rancho Cucamonga for your footwear needs. If you are looking for Comfortable Men’s Dress Shoes for Plantar Fasciitis in Riverside, Moreno Valley, Corona, Rubidoux, Loma Linda, Grand Terrace, Redlands or Norco; then visit our store in Riverside for your footwear needs. If you are looking for Comfortable Men’s Dress Shoes for Plantar Fasciitis in the Temecula Valley, Murrieta, Fallbrook, Lake Elsinore, Wildomar, Hemet, San Jacinto, Pala, Sun City, Menifee, Canyon Lake, Perris, Bonsall or Anza; then visit our store in Temecula for your footwear needs. If you are looking for Comfortable Men’s Dress Shoes for Plantar Fasciitis in Indio, Coachella, Thermal, Vista Santa Rosa, Valerie; then visit our store in La Quinta for your footwear needs. If you are looking for Comfortable Men’s Dress Shoes for Plantar Fasciitis in Cathedral City, Thousand Palms, Palm Desert, Palm Springs, Desert Springs, Rancho Mirage or Bermuda Dunes; then visit our store in Palm Desert for your footwear needs.